Its major export partners are the United States, Brazil, and Argentina. Its main exports are petroleum and petroleum products, liquefied natural gas, and methanol. Its major import partners are the United States, China, and Gabon. Its major imports include mineral fuels, lubricants, machinery, and transportation equipment. Located in the Caribbean, Trinidad and Tobago is an island nation. It has a 362.00 km coastline. Barbados and Trinidad and Tobago abide by the April 2006 permanent Court of Arbitration decision. The capital of Trinidad and Tobago is Port of Spain, which is located in the northeastern part of Trinidad Island. It has maintained the title of capital city since 1757. The city’s economy has been given a significant boost by cruise ships. The capital city of Trinidad has amazing tourist attraction sites to choose from within the city. The capital city generally experiences two climatic seasons: the dry season and the rainy season. Dry months in the city start from February to mid-April while the wet months start from June to December. The most favorable months to visit the city are the dry months. The three months will provide the best climatic conditions to experience great outdoor spaces while exploring the rich culture. Trinidad and Tobago is a North American country covering 5,128.00 km2. This makes it the 31st smallest country in the world and slightly smaller than Delaware. Its geographic coordinates are 11 00 N, 61 00 W and Port of Spain is the capital city. The islands were named by Christopher Columbus. Its ISO code is TT. Trinidad and Tobago has a mean elevation of 83 m above sea level. It has a temperate climate in the north with mild, rainy winters and hot dry winners; the climate in the south is arid. The terrain consists mostly of plains with some hills and low mountains. Trinidad and Tobago has a population of 1,220,479 making it the 158th largest in the world. 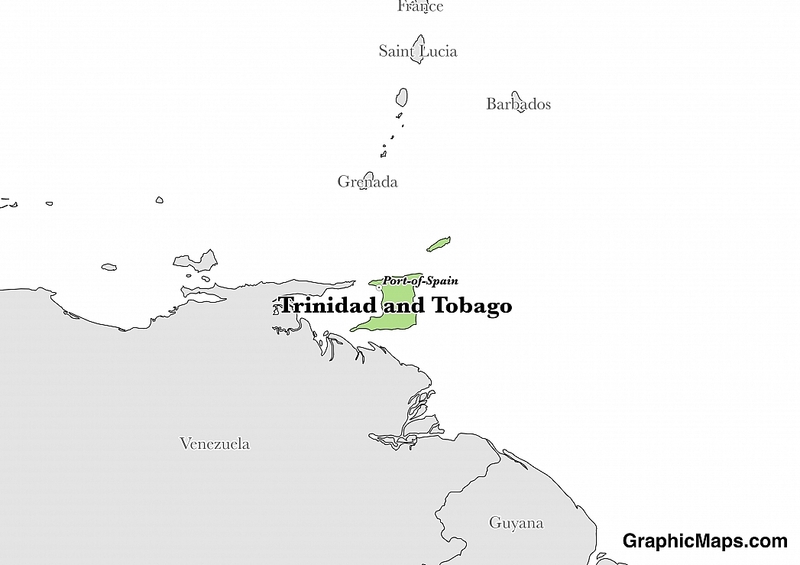 The majority of the population of Trinidad is found on the island's western half; on Tobago, it's the southern half. English is the official language. The major ethnic groups include East Indian, African, and mixed. The majority of the country is Roman Catholic or Protestant. Trinidad and Tobago's official language is English. The common English spoke in the Twin Island is Trinidad Creole English, but some people speak Tabogo Creole English. The twin islands' population is diverse, which leads to a variety of languages being spoken. English is taught in schools and used across the country, but French is also taught, especially in rural areas. The country's proximity to South America means that Spanish is also frequently used. Some of the indigenous languages on the island are Yoa, Carib, and Shebaya. Minority languages include African Yoruba language, Chinese, Coco Payol and Patois. The dialing code for the country is -867. Trinidad and Tobago is an independent country. It gained independence from the United Kingdom in 1962. Its constitution was last ratified in 1976. The Republic of Trinidad and Tobago is an island, and so borders no other country. It is governed by a democratic type of government modeled after the British type of government. They have both a president and a prime minister. The electoral boundaries commission handles Trinidad and Tobago's election. Anyone aged 18 and above is eligible to vote, while the Electoral College elects the president, and he/she appoints the prime minister. Factoring in Purchasing Power Parity, Trinidad and Tobago's GDP is $43,570,000,000.00 (USD) with $31,900.00 (USD) per capita. This makes it the 110th largest economy and its citizens the 56th richest in the world. The currency of Trinidad and Tobago is the Dollar (TTD). Its major export partners are the United States, Brazil, and Argentina. Its main exports are petroleum and petroleum products, liquefied natural gas, and methanol. Its major import partners are the United States, China, and Gabon. Its major imports include mineral fuels, lubricants, machinery, and transportation equipment. 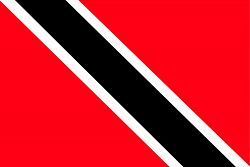 The Republic of Trinidad and Tobago’s flag is called the Sun-Sea-Sand Banner. It was adopted in 1962 after the country gained its independence from the United Kingdom. Carlyle Chang, who was a member of the Independence Committee that was responsible for designing the country’s symbols, came up with the flag's design. Before this, they had been using the British Blue Ensign as the colonial flag since 1889. The flag is mostly red with a black band that has a white border running diagonally from its upper left corner to the lower right corner. The colors red, black, and white were chosen as they represented the elements of water, earth, and fire which would symbolize the country’s past, present, and future. The color red represents the warmth of the people as well as the sun. The black color represents the wealth of the land as well as the people’s dedication and strong bond. The white is for the sea and the people’s purity and equality. The country’s navy uses the British’s White Ensign with Trinidad and Tobago’s flag in its upper left quarter.